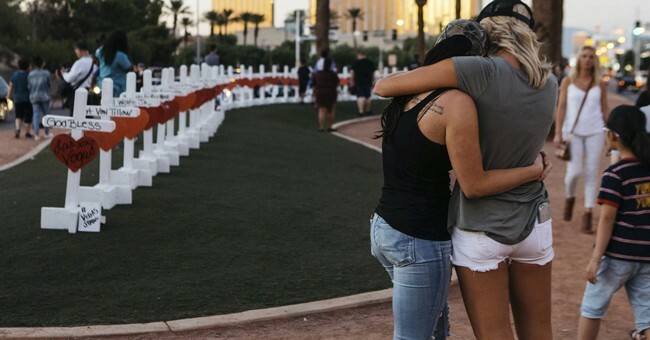 After the tragic shooting in Las Vegas in October 2017, the gunman's mother handed over his estate to the victims' families. Over the last few months the families have had a difficult decision to make: do they sell the guns and divide the money evenly amongst themselves or do they have the firearms destroyed? The guns were valued at $62,300, which would give the 58 victims' families a little more than $1,000 each. Now it looks as though they may not have to make the decision at all. An anonymous donor, only known as a "San Francisco software executive," stepped in and donated $62,500. But here's the catch: the person doesn't want the firearms. He or she wants them destroyed, CNN reported. The attorney for the special administrator of Stephen Paddock's estate, Alice Denton, said the money had been deposited into the trust's account. The trust needs permissions from the court on every move the trust makes, including the potential destruction of the firearms. A probate judge is expected to hear this portion of the case in early March. When the donor initially read about firearms' potential sale, he reached out to the New York Times and asked to be put in touch with Denton. That's when the donation was made. If the judge decides the guns should not be destroyed, the donor would have his money refunded. If the judge approves the donation, the money would then be distributed from the trust to each of the 58 victims' families. According to Denton, there aren't very many in her position who have dealt with a situation like this. "I don't think there has been more than 1 or 2 attorneys in the United States that have dealt with a position like this. Very seldom do you find a mass murderer having assets," Denton explained. "The question becomes, if we liquidate these guns and sell these guns, which is required as part of the special administrator's duty, we will be perpetuating the violence that actually caused the death of those individuals." Victims' families seem to be at odds on the issue. One one hand, Neysa Tonks, the sister of Mynda Smith, said the guns should be destroyed. "For us, it really is emotional trauma to continually go through things like this, to have situations pop up that are a reminder of the ugliness of it all. We never wanted financial gain -- it wasn't of importance to us," Smith told CNN. "But if this man is willing to pay to destroy something associated with evil, that is a gift to not only us, but to the families and survivors." Smith said if the guns belonged to anyone else, she wouldn't see the use in destroying them but because they belonged to Paddock, they'll always have a negative association with the shooting. "If it were just guns, there's no good in destroying them," Smith explained. "But it's not just guns. They were associated with him. They will always be his guns. They would buy it with the intent of buying his guns. It can't bring any good to these families." Another family, however, wanted to sue firearm manufacturers over the shooting and wants to have the guns be left in tact for their lawsuit. "The family does not care about guns that were not used in the shooting being destroyed," the family's attorney, Rick Friedman, told CNN. "...but guns that were used in shooting, they want preserved until any legal stuff is over." A handgun and 23 rifles were found in Paddock's suite at the Mandalay Bay. He had seven rifles, seven shotguns and five handguns in his home in Mesquite and two shotguns and five handguns were found in his Reno home.